Writing Daughter Wait! wasn’t something I intended to do. It just happened. A few years ago when I felt the prompt to start writing I began writing. Mostly I wrote messages. Writing messages became blogging and blogging turned into a love affair with words that resulted in me dreaming of one day writing a book. At this point, I remembered that I had written a book. Eight years earlier. How does one forget such a thing? My memory is a gift and a hindrance at times…. 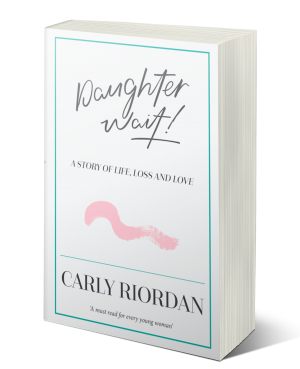 After searching through poorly sorted files on a hard drive, I recovered the initial scramblings of Daughter Wait! and it was terrible and lovely all in one. Terrible in style and lovely in the rawness of intricate details I’d captured long ago. On the skeleton bones of book beginnings, I began to put flesh on what was recovered and a book began to take shape. The road to publishing and releasing a book was not well planned. There was waiting, and more waiting, edits, and re-edits, sold outs and re-releases. The launch was never celebrated because by the time it came around I had sold all my copies in the pre-sale phase. I’m still embarrassed about that. Such an anti-climax. Some tell me it’s a wonderful thing. How is it wonderful when people want to order my book and it is unavailable?! However, in all the small steps I hadn’t recognised what I was doing in the unseen. It wasn’t until readers (new friends as I call them) began to reach out to me, an overwhelming gratitude began to take up residence in my heart. And then they begin sharing their own stories, usually with the thread of vulnerability, and overarching honest desire to have Jesus at the centre of their life. That’s when my tears begin to fall and overwhelming gratitude grips me for a moment. For a while, I can do nothing else but feel it, take it in, and just sit with the feeling: I wrote a book. People are reading it. People are enjoying it. And they getting something from it. What I didn’t realise I was doing as I crafted thoughts into the shape of a book, was that in releasing Daughter Wait! I was giving others permission to feel, to ask questions, to wrestle, to cry, forgive and once again ask Jesus afresh to direct every step from now into the future. In the process, I learnt that one of my hearts desires is to start conversations that people finish with Jesus. The other thing I learnt, is that we need to be intentional with our time in order for it to truly count. The thing that haunts me is that no one asked me to write. Not one person. Along the way many people asked me to do lots of other things; organise events, work, church, home life, dinners, laundry, RSVP lists, bills… All sorts of pressures and deadlines but no one, not once, asked me to write a book. The point is, that writing was never a loud demand it was a whisper I could have easily ignored. On the other side of releasing Daughter Wait! I am catching onto the eternal consequences of small steps of obedience. These small steps of obedience have led to more adventures taking shape in my heart. Books waiting to be written. But this ramble is not about me. It started with me but I am hoping it will end with you. You and Jesus. What I’m wondering is, if, like me, there are some ideas fluttering around in your heart that you just can’t ignore? What are they? Where do you wish you could spend more time? What is it that you wish? Can I encourage you not to underestimate the outcome of small steps in the right direction? Who knows where those small steps will take you. You owe it to yourselves and others around you to start the journey. Finally publishing a book (and having copies to sell) is a huge dream come true. I couldn’t have done it without you. Kind-hearted people such as yourself cheering me on along the way. For all those who pre-ordered, shared content and recommended the book to friends, I will be eternally grateful. Thank you. You were part of my small steps of obedience carrying eternal significance. This obedience also somehow led to my personal Christmas miracle: the third printing of Daughter Wait! arrived on my doorstep last week. I was told it wouldn’t arrive until January. I didn’t even have to wait for the eleventh hour! But here we are in the first week of December and the books have arrived. God is so good. If you want a copy you can order now and you’ll receive it before Christmas. In fact, I promise to put it in the mail tomorrow for you. Before you go, if you are brave enough, could you share with me what you’d love to make more time for next year? What small steps do you want to take? For me, it’s another book, and more time with my family—oh goodness I know that’s a heart desire as I’m welling up just typing it. Yep, more time with my precious girls, and all those who I love. What is it for you? Comment below or feel free to contact me privately. I’d love to hear. Next > Paint your world with gratitude. A lesson in thanksgiving.